Investment grade (IG) corporate bonds continue to attract investment dollars. The latest fund flows show about half a billion inflows into IG ETFs (like LQD) and $1.8 billion into IG mutual funds. While junk bonds were impacted by the recent downward adjustment, investment grade bonds did not respond the same way. Even though investment grade spreads widened, the corresponding decline in treasury yields provided an offset. That kept the overall yield (treasury yield + bond spread) stable - it's a bit of a "self-hedging" product. Year to date LQD (investment grade ETF) has outperformed HYG (high yield ETF) by about 2% as the two diverged recently. With the Fed taking investment grade MBS paper out of the market, the bid for strong credits has risen. 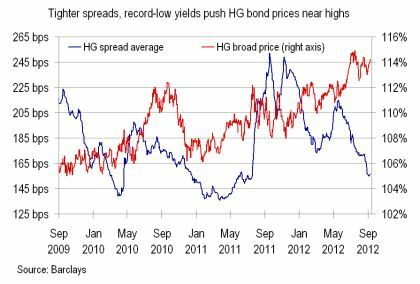 But IG corporate bonds are now "priced to perfection". Companies have flooded the market with new supply during the third quarter. LCD: - ... the third quarter is on track for at least $215 billion of new supply placed to ravenous demand, more than 43% above issuance volume over the same period last year, according to LCD data that excludes sovereign, supranational, split-rated, and preferred-stock issues. All this makes corporate bonds increasingly vulnerable to risks in the Eurozone, particularly if spreads widen more than treasury yields decline. LCD: - After corporate credit spreads trended steadily tighter through a robust slate of new-issue supply over the third quarter, flat progressions for spreads over the last several sessions may be at risk as the high-grade market drifts into the fourth quarter against the backdrop of unrest in Europe, trade data show.